How does Moses make his coffee? Hebrews it. "Hey Koala! What are you doing?" The koala says: "Smoking a joint." "Come up and have some." So the little lizard climbs up, sits next to the koala and they enjoy a large doobie. After a while the little lizard says his mouth is dry and he is going to get a drink from the river. The little lizard explains to the crocodile that he was sitting in the tree, smoking a joint with the koala, got too stoned, and then fell into the river while taking a drink. The crocodile says he has to see this. So they walk into the rain forest and find the tree where the koala is sitting, with yet another joint. He looks up and says, "Hey you!" "Fu-u-u-u-c-c-k, Dude....... How much water did you drink? Jimmo was a bush guide, taking bunches of city types out in the outback. He would show them that even parched looking places could supply food, how to hide from the sun and, if met, what to avoid. At about midday one of the clients, who's watch had given up in the heat, asked him what the tine was. Jimmo took off his hat, held it up and said, "Twenty to twelve." Another client, having glanced at his watch, said, "Blimey, that's dead on, do you use your hat to measure the Sun's angle?" "Naw," replied Jimmo, "I don't like me watch on me wrist, it catches on things, so I sewed it inside me hat - always got that near me." 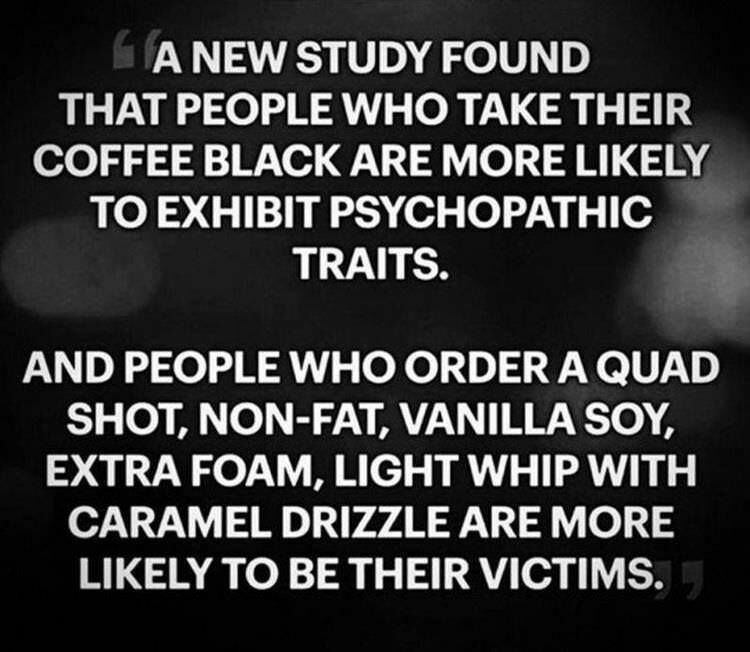 Oh, dear, I always drink black coffee . . .
Not an "Americano", just a black coffee please. Or I''ll bite yer friggin nose off! I thought it was kind of amusing. I'm not really that cranky until I've had my coffee in the morning...said no wife ever. j/k, I've been married to the same gal for 37 years. I discovered International Delight Hazelnut Creamer back in about '01. That stuff is soooo good! But it was like crack! I found myself driving to various stores to get it, because I only liked that flavor. 6 AM, driving from store to store, to score it. I finally just went and quit cold turkey. Nothing owns me like that. Jacko was a fair dinkum bushie that took mobs of townies out bush. He showed them how to get bush tucker even if it was as dry as a dead dingo's donga, how to keep out of the heat and how to avoid getting bushwhacked. At about noon one day, one of the townies, whose cheap two-bob watch had karked it in the heat, asked him the time. Jacko took off his beaten up old slouch hat held it up and said "twenty to twelve". Another of the townies, having glanced at his watch, said, "Crikey, that's dead set right on, do you use your hat to measure the Sun's angle?" "Yeah, Nah," replied Jacko, "I don't like me watch on me wrist, it catches on things, so I sewed it inside me hat - always got that near me." I liked the original, but I just couldn't help myself. Thanks for the accurate translation Blue. For we yanks it is humorous, but it must be dead serious for authentic Aussies.